My Nana was my hero. She was a strong woman who never looked at a mans job and assumed she couldn’t do it. She was my first mentor and my constant companion as a child. I lived right down the street and her living room was my happy place. She shared all kinds of secrets with me. She told me about her childhood friends, the secret compartment in her dresser, and that she had once gone to charm school. She told me of her plan to especially spoil my brother Max because she had been a middle child and knew how invisible they felt – but that once she became a grandmother she knew she could never ever let any of us feel that invisibility or distance from her. She told me about her pentecostal mother and her fears that I might become a “holy roller” like her. She told me about trusting Jesus in the middle of an Ozark river on a hot summer day when she was 11, she encouraged me to do the same. She told me stories about her amazing grandpa and I knew that her love for me reflected his devotion to her. She told me that my Grandpa had secretly taken evening Bible classes to be able to hold his own when talking to her mother. She told me about her first marriage and how she had just left. She told me why and I’ll keep that to myself. She shared almost everything with me. In the autumn of 1980 I was a freshman in college. I was going to get my first chance to vote. I got up before class and headed to my polling place, my elementary school. As I finished up I saw Grandma and Grandpa in the parking lot. Grandma had been very ill for several years and by this time she could barely walk. I helped Grandpa get her inside. If I recall correctly it was only about the third time that year that she had left the house except to go to the doctor. She had not even been able to attend my high school graduation. If she went through all this it was crystal clear to me that this was important to her – doing her civic duty was a priority. This image has stayed with me my whole life. Grandma’s hands had shaken as long as I could remember, but by now she could no longer write. She went into that booth and I stayed outside the curtain in case she needed help while Grandpa voted. It took her forever with to get the correct hole punched – and she would accept no help. When she was finished Grandpa and I helped her make the long slow walk back to the car. Sometimes I wonder if we would be a kinder and gentler society if we remembered the privilege of a “secret ballot”. I know that there has been a lack of civility with people putting an all-or-nothing spin on their political leanings. I’ll be glad to go back to hearing about everyone’s grandkids on Facebook tomorrow. Don’t get me wrong – I have strong opinions, I may not have posted a play-by-play on the presidential debates on my Facebook page. I didn’t put up any yard signs or plaster my Jeep with bumper stickers. I didn’t attend any fundraisers. I did my research and I did my talking at the ballot box. This entry was posted in Reminiscences and tagged 1980, Election, Grandma, secret ballot, voting by artsifrtsy. Bookmark the permalink. Haha – I read it – really lovely piece. Everyone should have a Nana. I love this post! And the picture is perfection. Thanks for stopping by! Thank you – this is one of my favorite shots of her. Thanks for the follow as well. Love this post. It made me stop and spend a few minutes thinking of my grandma, whom I adored, and the special relationship I had with her. I too, remember it being stressed (by all the adults in my life) that voting was private, and it was a treasured right not to share that information. LOL – My grandma helped make that couch in the next post. 🙂 Strength and pragmatism – both in spades. I think they lived through such times that those were necessary qualities. Mine also had a wicked sense of humor. Mine was a big personality – great story teller. She loved us fiercely. I miss her like crazy. Wonderful, truly wonderful. Thank you. Thanks for stopping by – I appreciate it! You are as wise as she, friend. OH MY GOSH I’M GLAD IT’S OVER TOO!!!!!! Blechhh! Only another 3-4 days of analysis – then we can go back to whatever we were doing 2 years ago. What a great post. I agree wholeheartedly with your sentiments (& your Grandmothers). I find the amount of publicity in US elections overwhelming at the best of times (sorry, but I do) – it’s almost like a civil war. I’m proud to be Australian and love this country, but even our own Govt. & State compulsory elections leave me a bit overwhelmed. Usually by the time election day comes around I feel like making an ‘invalid’ vote (& did so one year as I got fed up with the constant tv advertisements & bickering & slanging matches between the major parties). A wonderful post and a lasting tribute to your Grandmother. Thanks for digging down and sharing this look at your life. What a lovely post and a good point. Thanks, I appreciate that – I have been writing so much that it’s seeming to flow a bit better. How are you doing with your NaNo? NaNo is slow going. I really have to resist the urge to go back and edit. It seems to be making me think more about what I write, and I already over think, you know. Yeah, I’m going silent on the whole political rig-a-ma-role. Of course, my husband is glued to the TV in the other room. So, here I am writing… 🙂 My grandmother was a big part of my life. She never drove a car, I doubt she voted. She gave lots of advice though. Wow – never drove a car. My gran had a lead foot:) It’s amazing the influence they have in our lives. I have been trying to write but I’m getting election updates on my iMessage – it’s play-by-play at this point. The good thing is that I am working in a direction that I know I can move forward with tomorrow even if I get behind. I just had a conversation with my daughter while standing in line to vote tonight. My mother-in-law leaned over and asked my daughter who she was voting for and my daughter belted out her answer very loudly. Everyone turned around in line and stared – woo, you could see the blue and red on their faces. So we had to talk about privacy,etc. Loved this post about your grandma – she sounds like a wise woman. This is a beautiful post and says a lot about keeping things in their proper perspective. I have friends on both sides of the fence, I love them all, I have very strong opinions on politics and what I think this country is about and I don’t like to discuss it. I think your grandma had it right. By the way, you resemble her in many ways. All good! Is that you on her lap? You know, I don’t even mind a discussion, it’s the fighting that I can’t really stomach. 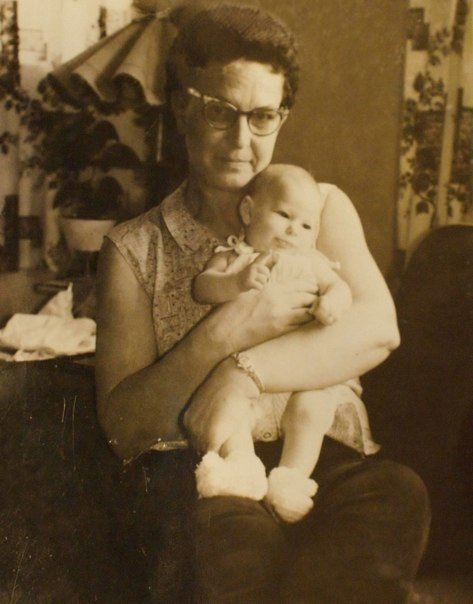 I would like to think I am like my grandma:) – Yes that is me – I was her first grandchild. She was a bit younger than I am now in that pic. my problem I guess, is that I can’t stand most politicians. And yes, fatigue beyond belief.